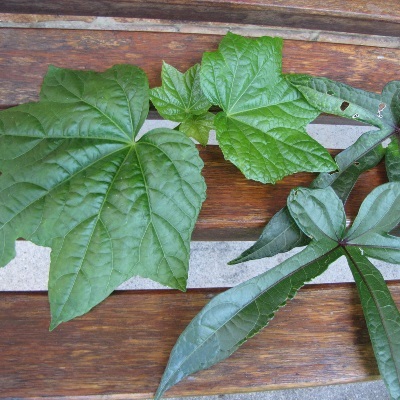 Edible hibiscus, Aibika or Abelmoschus manihot,is a delicious leaf from a perennial plant, that at first I did not have a clue what to do with. It seemed such as waste having all this potential food growing in the garden and not being used. The edible hibiscus grows as a handsome, tall bush, producing rich green, grape-shape leaves throughout the year. I have both the wide and narrow leaved varieties. Now that I’ve been experimenting on the family, we enjoy the narrow leaf variety sliced into rice dishes, stir fries and noodle dishes. The wide leaved plant stands out in a league of its own though when stuffed and rolled up as you would dolmades, the Greek stuffed vine leaves. Everything loves it’s tasty leaves, so keep the grasshoppers off by netting the new leaves with frost protection fabric or gauze.Here is one of our favourite recipe for the hibiscus leaf rolls with an Asian flavour. It’s vegetarian, but delights even the meat eaters. Mix all the filling ingredients together in a bowl. Using a tablespoon, place one spoonful of filling towards the stem end of each hibiscus leaf. Roll the stem end of the leaf over the filling then fold in the sides of the leaf package. Finally, roll the leaf up and secure with a toothpick or small skewer. Place the leafy package into a baking dish and repeat with the rest of the leaves and filling. Mix the coconut milk, stock powder and water then pour over the rolls. Bake at 180C for 20 minutes. Serve hot or cold.